March 4  . . . About a mile on this side Clearfield my husband and Sister mett Joe [Gibbs], he had the impudence, as M Courtney told M[ary] S[andwith] to come up into her room, she ask’d him what he wanted, he reply’d, to see something you have got here, and then look’d into the Cradle—she ask’d him if he own’d it, he say’d No, and further this deponent sayeth not. If he had not seen the Child, he had all reason to belive it was his, but the colour was convincing, he had frequently boasted of it, but was fearful of the expences that might accrue. . . . When HD. come home we related the above to him, concluded were we to turn her off, upon her mothers terms, she would be in the high road to further ruin—he call’d her into the parlor this evening and talk’d closely to her, told her he had a right to send her to the work house and sell her for a servent, that it was in pity to her, and in hopes of her reformation that he did not send Joe to prision, she had always had a good example in our house, if she did not mend her conduct she should not stay much longer in it &c. she cry’d but said nothing—How it will end, or what we shall do with her, I know not, set aside this vile propensity, she is one of the most handy and best servants we have ever had—and a girl of very pritty manners. [April 12, 1796] . . . Sally Johnson came to day, she very willingly agree’d to Sallys staying with us two months longer as we shall be cleaning house &c—she is, I expect, sensible, that we might, if inclined so to do, oblidge her to serve us near a year longer for the expences we have been at on her and Childs account, instead of giving her freedom Cloaths &c—I wish the poor girl may do well when she leaves us. She has behaved herself better for a month or two past than for a long time before. Whether it is to get the more from us, or whether she is actualy better I know not, but must hope for the best. Sally Brant did leave the Drinker family but stayed in touch with one of the other young servants—“S. Brant took tea with our Sally Dawson” noted Elizabeth Drinker tersely on May 17, 1803. The passages in this post can be found on pages 212-213 of In the Words of Women. In 1794, Elizabeth Sandwith Drinker (see posts on Drinker here and here) and her husband Henry had to deal with a problem concerning a young black servant whose mother had arranged an indenture with the Drinkers. [August 8, 1794] . . . I have been for a week past under great anxiety of mind on account of our poor little and I fear miserable S[ally] B[rant]—’tis possible I may be mistaken, ‘tho I great fear the reverse. 11. . . . it was late when I retir’d to my chamber, and later when I went to sleep—the thought of the unhappy Child that lay on the mattress at the foot of my bed, who does not appear to feel half so much for herself, as I do for her, keep’t me wakeing. . . . H[enry]. and E[lizabeth] D[rinker]. had a trying conversation, if a conversation it cold be call’d. with SB—poor poor Girl, who could have thought it? . . .
[October 31, 1794] . . . Sally Johnson and her daughter Franks came here before dinner, on a visit to her daughter SB. they stay’d an hour or two, eat dinner . . . she left herbs to make tea for SB. said it was good to procure an easy [labor]. . . .
[Nov.] 7 . . . I settled matters with Mary [Courtney at ‘Clearfield’, the Drinker farm 5 or 6 miles outside Philadelphia], concerning our poor Sall, who I intend leaving with her, ’till her grevious business is settld, I look on Mary as a well minded and well disposed woman, and who, with our help, will take the proper care of her. . . .
Decr. 2 . . . S.B. was this morning about 6 o’clock deliver’d of a daughter, the mother and Child both well. . . .
6 . . . Sister [Mary Sandwith] and William went this fore noon . . . found S.B. and her bantling well, Sally weep’d when she saw MS—and cover’d her head with the bed-cloaths—The Child is very Yallow for one so young. . . .
23 Decr. . . . S.B. is very well, and in rather too good spirits, everything considered, she had nam’d the Jaune pettet, [the little yellow one] Hannah G—bs [Gibbs], I disaprovd it, and chang’d it to Catharine Clearfield, with which she appear’d displeas’d. . . .
Diary entries are In the Words of Women, pages 211-212. 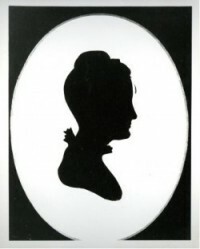 The photograph is of a silhouette of Drinker at the Pennsylvania Historical Society.